The ancient city (Akragasfor the Greeks, but Agrigentum for the Romans, whence its present name, given to it in 1927) occupied a magnificent panorarnic position on a high plateau dominated to the N by two hills, which constituted the Acropolis (the Rupe Ateneaand the adjacent Colle di Girgenti), and terminating to the S in the Hill of the Temples, so called because on it, a part from other minor items, stand the remains of the 7 temples out of the original 10 or more which still remind us of this glorious centre of Greek civilization in Sicily. Felicitous circumstances of time and place allowed the city to have an exceptionally prosperous development (the “tyrannies” of Phalaris and Theron, though quite different in nature, had equal influences on the historical destiny of Agrigento in the first two centuries of its existence) and very soon the city presented itself, also to foreign visitors, with an air of magnificence. Thus Pindar in the l2th pythian Ode sings of it in about 490 BC, as “the lover of splendour”, “the most beautiful city of mortal men”, the site that was “sacred to Persephone”, the goddess who with her mother Demeter was the object of intense veneration. MONUMENTS On the Rupe Atenea highland, there was already at the time of the foundation of the city a sanctuary of Zeus Atabyrios and of Athena Poliàs, protective divinities imported from Rhodes (where however they had separate cults). It is also mentioned by Polybius, but no trace of it remains today. At the E end of the Rupe, there is a whole series of notable monuments: the Temple of Demeter (what remains of the tempie is incorporated in the structure of the little mediaeval church of San Biagio); the Rock Sanctuary of Demeter and Persephone, sacred to the cult of the waters gushing from two natural caves; and Gate I of the ancient fortifications. Not farfrom this is the Tenaille Bastion: a massive wedge-shaped construction consisting of two great walls meeting at right angles. Proceeding southwards we Come to a dip, at Gate II: this is the “Gela Gate”, through which a road from the valley of the river Akragas entered the city. On the horizontal piane beneath the dip, some bothroi and a hearth have been identified, clear signs of a small rock sanctuary of the chthonian cult which must have been connected with the more ancient cult of St Biagio. From here it is not difficult to reach the modern road leading to the Temple of Juno. Just before reaching it, we find on the left a Basilicula of clearly Roman origin, with two ampie symmetric tombs, possibly a memoria martyrumofthe holy martyrs of Agrigento, Peregrinus and Libertinus. And then we see, solitary and majestic, the Tempie of Juno, high up at the end of the Hill of the Temples. Dating from 460-450 BC, it is a peripteral hexastyle tempie, on four-stepped stylobates. The cella is in three parts, pronaos, naos and opisthodomos. Opposite, to the E, are the remains of the sacrificial altar, which is outside the Tempie, as was customary in ancient Greek religious cults. At the foot of the temple, to the W, there is an opening in the boundary wall. This is a gateway for a road leading to Gela. A modern road flanks the E side of the Hill of the Temples. Along the first stretch, for about 150 metres, it is possible to see on the left the remains of ancient fortifications, which are riddled with the niches and arcosolia of the Palaeochristian and Byzantine necropolis that occupied the area at the end of the pagan age. On the right, just before reaching the Temple of Concord, we can visit the Palaeochristian Antiquarium of Agrigento. All the exhibits are clearly displayed. And here we are at the Temple of Concord, one of the best preserved Doric Temples in all the Greek world. Built between 450 and 440 BC, it is, thanks to its proportions and the beauty of its shape, a masterpiece in style. The plan is identical to that of the Temple of Juno. Its attribution is uncertain: the term “Concord” is however entirely arbitrary, as it was taken from a Roman inscription found in the vicinity. The Temple underwent considerable transformation and alterations at the end of the 6th c. BC when Bishop Gregory made it the Cathedral of Agrigento.This is the origin of the fine arches perforating the walls of the cella. Continuing W we reach the point where the garden of Villa Aurea begins. In the territory to the N stretches a vast cemetery area with sub divo tombs, i.e. in the open air, which are part of the Palaeochristian-Byzantine Necropolis. These are the catacombs known as the Grotte di Fragapane and the Necropoli Giambertoni, which is a part of the Roman Necropolis located during recent excavations in the Piano di San Gregorio, S of this part of the Hill of the Temples. Passing the Villa Aurea, we come to the Temple of Herakles (or Hercules), built about 510 BC and the oldest of the Agrigentine temples. Eight columns remain on the S side which were re-erected in 1928. The temple was peripteral and hexastyle but it had 15 colurnns on the long sides, which is a sign of its archaic quality. The ruins of the cella clearly show that it was destroyed by an earthquake. On the E front there are the remains of an altar. The attribution of the tempie to Herakles comes down to us from a well-known passage in Cicero’s 4th Verrine. A little further on, the modern national road curves to the left to pass through Gate IV (called by the Byzantines the “Golden Gate”, because of its particular magnificence), leading to the road running from the Emporium and over the Piano di San Gregorio. On the left is a burial monument, erroneously known as the Tomb of Theron. This consists of two superimposed parts: an almost cubic podium, built to a square plan, and a sort of little tempie in Doric style with false doors and Ionic-type corner colurnns. Very probably the building was originally completed by acusp-shaped roof. The Sanctuary of Asclepius (or Esculapius) stood at the far end of the plain, on the right bank of the River San Biagio. Around the ruins of the tempie, there is a building in antis of Doric order, consisting of a pronaos and cella, and with a false opisthodomos, from the W wall of which two half-colurnns with Doric groovingjut out, in between stout corner pillars which have the appearance and function of antae. It dates back to the second half of the 5thc. BC. The Temple of Herakles, seen before, looks N over a modern car-park which occupies part of the area of the ancient agorà (i.e. the forum). To the W, beyond the great altar for the sacrifices of 100 oxen (hecatombs), stood the colossal Temple of Olympian Zeus, one of the largest constructions of Greek architecture: 112.60 x 56.30 m in size, a donary of the Agrigentines to the Father of the Gods after the great victory over the Carthaginians at Himera in 480 BC. Its shape was absolutely original. The temple was pseudoperipteral, and instead ofthe normal peristyle it was surrounded by a solid wall out of which jutted half-colurnns (7 x 14). Among these, in the higher part, were hewn imposing figures of giants (7.65 m in height); these 38 Telamones, as they are called, contributed efficiently to the support of the great weight of the entablature. An earthquake, the same one as that mentioned with regard to the Temple of Herakles, and probably also the same earthquake that destroyed the temples of Selinunte, also brought this temple to the ground. Now nothing remains but great piles of ruins, what was left after much material was removed in the mid-18th c. for the construction of the harbour walls of the nearby Porto Empedocle. In the middle of the area of the cella is a modem cast of a Telamon: the original has been transferred to the Museum. A decumanus makes a sharp tum irregularly S in order to pass through a gateway built into the fortifications: this is Gate V, recently excavated. 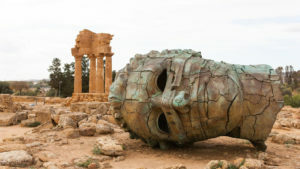 It also marks the boundary between the Temple of Zeus and another temple which is by far the best known of all the temples of Agrigento: the Temple of the Chthonian or Earth Gods (Demeter and Persephone). An outstanding feature of it is the picturesque group of four colurnns with elements of the overlying entablature, the result of reconstruction work performed in the first decades of the 19th c., since when the temple they belong to has improperly been called the Temple of Castor and Pollux or of the Dioscuri. Its oldest parts date back to the first half of the 6th c. BC: it has numerous altars and hearths, holy enclosures of various size and shape, incomplete temple bases, and votive pits which have yielded large quantities of offerings, many made of terracotta. In the middle of the 5th c. there were certainly two temples here, side by side. The titular divinities of the two buildings, as in a similar sanctuary in Syracuse, were Demeter and Persephone. It is thought that the third temple, of which remains can be seen in the S part of the sanctuary, dates to the Hellenistic period: this is known as Temple L. A wide and deep cutting (at the bottom of which it is very likely that the Colymbetra was situated, the marvellous swimming-pool mentioned by Diodorus) separates the Hill of the Temples from another rocky spur lying opposite it. Access is extremely difficult. Here one should visit what remains (two columns and the base) of the Temple of Vulcan, or Hephaestus, another Doric tempIe of canonic form, a hexastyle peripteral temple with 13 columns on the long sides, built in the last third of the 5th c. BC, on the site of a pre-existing archaic sacellum, the roof of which has yielded interesting elements of polychromatic fictile decoration now displayed in the Archaeological Museum.Leaving the Hill of the Temples (World Humanity Heritage by Unesco, declared in May 2001), we must follow the national road leading to the modem city. At a distance of about 1.5 km, after a couple of bends, a gate on the right opens into the excavations of the Hellenistic-Roman Quarter, so called because the complex of buildings brought to light was found to have developed, on ascertained preexisting structures, in the centuries between about the 3rd c. BC and the 3rd-4th c. AD. It was in this area that it became possible, around the year 1960, to have for the first time a clear idea of the lay-out of the ancient city. The zone is divided into 4 parallel cardines, which open to the N on to what must have been the decumanus maximus, which in this stretch is now incorporated in the modem state road. In between the cardines are a score of dwellings of various types (Hellenistic, Italic, mixed) and a few shops. The mosaic decoration of the floors is rich and various: from the opus signinum to the tessellation with geometric, plant or animal motifs depending on the period of their design. The area is particularly rich in wells, tanks, channels and sewers, which is an indication of the advanced stage of civilization of the ancient city . Retuning to the road we ascend a stairway on the left and come to the Church of San Nicola, from where there is a fine panoramic view over the Hill of the Temples. The present form of the church, which stands on pre-existing Norman remains, goes back to the Cistercians, who bui1t it in the 13th c. in Romanesque-Gothic style, re-employing material from the classical monuments, which is the reason for its pleasantly unusual appearance. Inside the church, which has a single nave surrounded on three sides by a cornice similar to that on the outside, we can admire the famous Sarcophagus of Phaedra and Hippolytus, whose story is represented on the four sides with varying high degrees of artistic value (this is a Roman work of the 2nd-3rd c. AD), and the Lord of the Ship, the crucifix which is the subject of one of Pirandello’s short stories. At the beginning of the Hellenistic period an Ekklesiasterion, shaped 1ike a Greek theatre, was hewn out of the rock in the terrain lying behind. This is the same as the Comitium, the meeting place of the assembly of the people. Some centuries later the Comitium was covered over once again, and an elegant little temple was built to the W of it, with a simple prostyle cella on a high podium: this is the Oratory of Phalaris. Next we can visit the Regional Archaeological Museum, which was erected in 1967, with scrupulous respect for the surrounding Agrigentine panorama into which it is set. It is the largest archaeological museum in central and southern Sicily, i.e. of that part of the island which historically was dominated by Agrigento. The material conserved in the museum is arranged with utmost scientific rigor. There are nineteen rooms. I, the entrance hall. II, the Agrigentine scene from pre-Greek times to the time of colonization. III, a rich collection of Greek vases found in various parts of the city necropolises, and a marble figure of a warrior: a splendid sculpture in the “severe style”. IV, architectural sculpture. V, Agrigentine sanctuaries of the classic and Hellenistic epoch, with numerous masterpieces of plastic art and terracotta produced in loco. VI, the Telamon, standing upright, brought here from the temple of Olympian Zeus. VII, the ancient city, with particular reference to the Hellenistic-Roman quarter. VIII, inscriptions. IX, coins. X, Greek and Roman sculptures: outstanding is the famous Ephebus of Agrigento. XI, recent excavations in the necropolises. XII and XIII, synthesis of prehistory in the area of Agrigento. XIV, topographical exhibition of the province of Agrigento. XV, Gela. XVI and XVII, material from recent excavations in the province of Catania. XVIII, material of secondary importance. XIX, temporary displays.